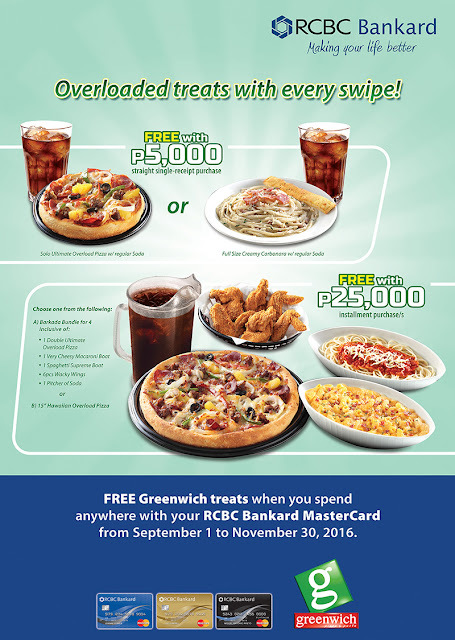 FREE Greenwich Treats w/ RCBC ~ Philippine Freebies, Promos, Contests and MORE! Have your fill of FREE Greenwich Treats everytime you swipe your RCBC card. For every P5,000 straight single-receipt purchase, you get to choose between a Full Size Creamy Carbonara or a Solo Ultimate Overload Pizza, both served with regular soda. For a higher spending worth P25,000 (single or accumulated of at least P10,000), a choice of Barkada Bundle for 4 (1 Double Ultimate Overload Pizza + 1 Very Cheesy Macaroni Boat + 1 Spaghetti Supreme Boat + 6pcs. Wacky Wings + 1 Pitcher of Soda) or 15" Hawaiian Overload Pizza is yours to take. You can redeem up to a maximum of three (3) Greenwich Treats per card, per day, per outlet. To claim your treat, simply present your card and surrender your charge slip transaction to any participating Greenwich outlets nationwide.